For a place of modest size, the New Forest village of Bank, 1.5 kilometres (1 mile) south-west of Lyndhurst village centre, has been home to more than its fair share of illustrious residents. The roll of honour includes the Duchess of Westminster; Admiral Lord Kerr; Sir Lancelot Elphinstone; Sir Robert Price, MP; the Misses Chamberlain, cousins of Prime Minister Neville Chamberlain; the Rt. Hon. Justice Sir John Fletcher Moulton, later to be Baron Moulton of Bank; and as a guest, Virginia Woolf. 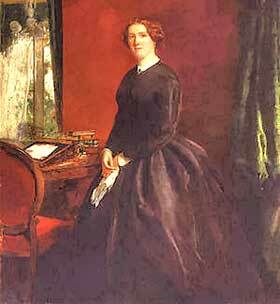 But perhaps the most celebrated resident was the one-time actress and prolific Victorian novelist Mary Elizabeth Braddon. Author of Lady Audley’s Secret (1862), Aurora Floyd (1863) and many other popular works, Miss Braddon lived at Annesley, a generously proportioned property set back from the lane leading to the tiny adjacent hamlet of Gritnam. Miss Braddon and her husband, the wealthy publisher John Maxwell, commissioned construction of Annesley in the early 1880s. Building started in 1883, using, in part, bricks made at nearby Allum Green, and in September, 1884 the Maxwells took up residence. The West Wing was added in 1894. The Maxwells used Annesley as a country home whilst retaining a permanent family home, Lichfield House, in Richmond, Surrey. 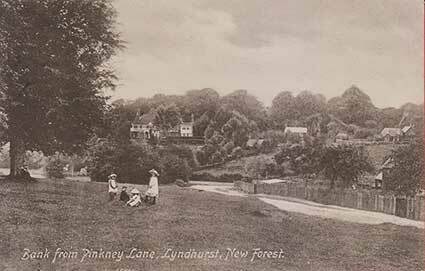 They often came to Annesley in mid-summer when their visits were of sufficient note to be announced in the local newspaper, the Hampshire Advertiser. The family seemed to be well-liked in the area, and were active members of the local community, responsible, for example, for providing public Reading Rooms at both Bank and nearby Emery Down. At Bank, the Reading Room was incorporated into The Cottage, the last roadside house on the lane leading to Gritnam. Originally just a single, small cottage, the Maxwells in 1883 had two more built, and it was the roadside one that served for public reading as well as, for a time, a school. In 1898, however, the three cottages were converted by the Maxwells into one large dwelling, and the Reading Room was lost, although it does still show on the Ordnance Survey map of that year. Was Miss Braddon treated as a celebrity? Well, the answer has to be yes, for in addition to mentions in the local press, she featured on contemporary post cards and photographs of Bank and, before sight of the house was obscured by trees, drivers of charabancs stopped on the nearby main road to provide passengers with a view. John Maxwell died in 1895 and his wife then rarely visited the village, preferring to lease the house to others. She died at Lichfield House in February, 1915, and is buried at Richmond Cemetery. A bronze, wall memorial plaque in Richmond Parish Church was unveiled by two of her grandchildren in the same year. Annesley was sold, and after a number of further changes of ownership, was purchased in 1943 by Dr. Barnados for use as a children’s home. They, in turn, sold it in 1971 for conversion to apartments, which continues to be the current use. Bank and Gritnam - what's in a name?